Two new titles are available for your downloading pleasure this fine day. The first comes to us from LucasArts, titled Lucidity. Lucidity is a new platformer set in a very surreal landscape, you play as Sofi and you enter her imagination and navigate all of the puzzle elements. As I always say, it's on XBLA, you can download the demo for free - so check it out. 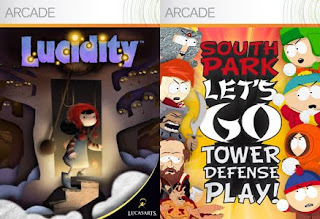 The second game is South Park Let's Go Tower Defense Play!, and really the only thing you need to know is it's Tower-defense style game featuring the South Park crew. Go play it now! We hope to have a review of these titles up in the upcoming days, until then, let us know what you think in the comments below.